Announced via Spotify's website, the Niland acquisition is Spotify's fourth this year, and marks an ongoing initiative to stay ahead of competitors like Apple Music. 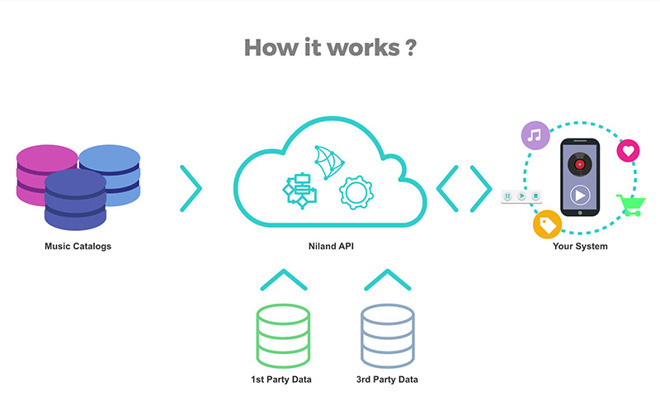 A small startup headquartered in Paris, Niland developed machine learning algorithms to analyze digital music. Prior to Spotify's purchase, Niland offered music search and recommendation services to "innovative music companies" through custom APIs. For example, Niland marketed its AI and audio processing technology by offering content creators and publishers a specialized audio search engine. Customers were able to upload tracks for processing and receive a list of similar sounding songs. The technology could also be used to surface similar tracks within a particular catalog, making for a powerful recommendation engine. Going further, Niland's tech can extract complex metadata pertaining to mood, type of voice, instrumentation, genre and tempo. The firm's APIs automatically process and tag these sonic watermarks for keyword searches like "pop female voice" or "jazz saxophone." Some of the same features went into a music recommendation engine that offered suggestions based on mood, activity, genre, song style and other factors. Spotify is most likely looking to integrate the AI-based engine into its app in the near term. "Niland has changed the game for how AI technology can optimize music search and recommendation capabilities and shares Spotify's passion for surfacing the right content to the right user at the right time," Spotify said in a statement. Niland's team will be relocated to Spotify's office in New York, where they will help the streaming giant improve its recommendation and personalization technologies. The move comes amidst a wider race to deliver the perfect personalized listening experience. Industry rivals are looking for ways to develop customized playlists, and Spotify appears to be investing heavily in intelligent software. Apple Music, on the other hand, touted human-curated playlists when it launched in 2015. Since then, Apple has integrated its own software-driven recommendation assets, the latest being iOS 10's "My New Music Mix." News of the Niland acquisition arrives less than a month after Spotify announced the purchase of Mediachain Labs, a blockchain startup focused that developed technologies for registering, identifying, tracking and managing content across the internet. The buying spree comes amid rapid growth for Spotify, which in March hit a milestone 50 million paid subscribers. Counting free-to-stream listeners, the service is said to boast more than 100 million users. By comparison, Apple Music reached 20 million in December, though Apple executive Jimmy Iovine in a recent interview said the product would have "400 million people on it" if a free tier was offered.